We assume that everyone loves their greyhound and wishes only the best for them. But if you let your dog get to the point where it has significant root exposure on its upper or lower canines, your dog will be in pain all the time and it will suffer endlessly - possibly until it dies from something else. We recently took in a boarder named Rosie whose canines were so bad that it warranted a photograph for all to see. The photos show, not only severe root exposure, but gum ulceration. It was uncomfortable for us, and certainly for the dog, to take this picture. In order to get some sense of its discomfort, you need to consider what this would feel like if it were your own mouth. Rosie has root exposure measuring about a 1/2 inch. Cleaning it and bonding just won't cut it in this case. Both upper canines needed to come out and what a blessing it would be! When she leaves, she will leave feeling so much better. As we extract each tooth, we also laser the gum tissue above it which will kill all of the surface bacteria and begin the healing process. This dog will no longer have upper canines but it will also not be in any discomfort and the gums will heal just fine. The dog doesn't need the teeth. We often see similar conditions with ulceration adjacent to the large rear molars. 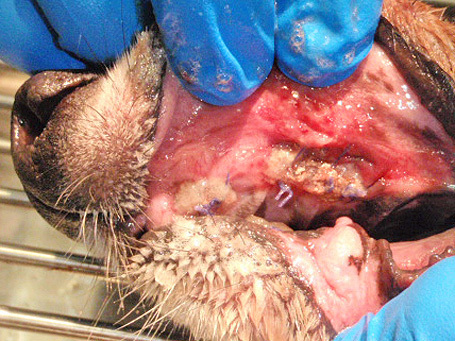 The constant rubbing of a rough, root exposed tooth loaded with plaque and tarter will give your dog endless pain. As for this writer, I get sick and tired of people telling me that they don't want to put their dog through the pain of having teeth pulled. If you've just been informed that your dog is in pain every minute of every day, you should just say, 'I don't feel like spending the money,' 'I just don't love my dog that much,' I can't afford it,' 'I don't want a payment plan,' or 'I am just too cheap'. 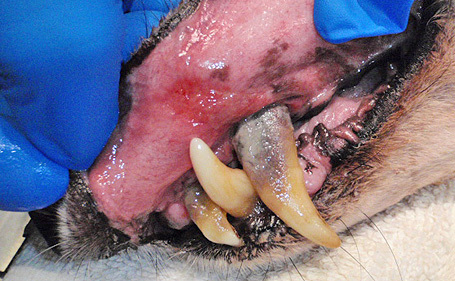 Greyhounds have dental issues and they rely on us for love, attention, AND dental care. They give us so much back in return and we owe it to them to find the money and have their dental issues dealt with. Going back over 20 years, we printed a t-shirt that said, 'No Excuses, Adopt a Greyhound'. I guess we need to print one that says, 'No Excuses, Clean My Teeth'. Dr. Mahesh Patel set a new precedent by coming in on Sunday, August 21st, to deal with Rosie's canines. As it turns out, Rosie had dental work done not that long ago although not by us. The previous vet chose not to do anything about her canines. 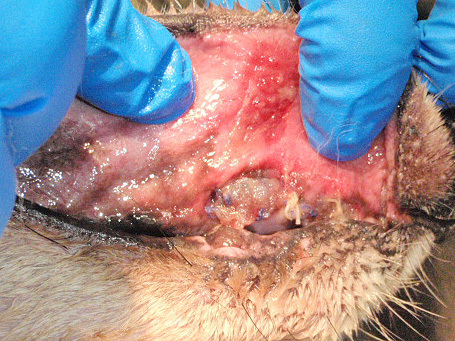 Above: Ulceration prior to laser treatment. The first photo shows where we have lasered her gum tissue. 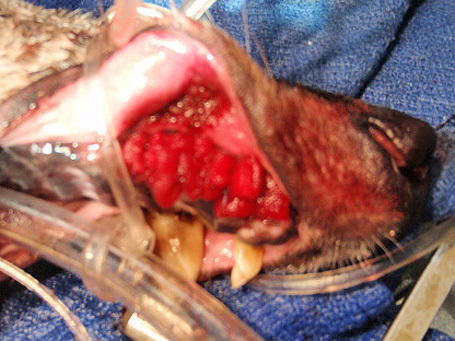 Although it appears that there is a scab there, the entire area above her canine and the one incisor to the left was lasered prior to the extraction. Listed below are indications of where the enamel ended, where the root exposure was, and how much of her tooth remained in the mouth. Above: From the bottom of each tooth to the first line is the pre-existing enamel; between the first and second line is root exposure; between the second and third line is pocket depth; between the third and the top of the tooth is root attachment. 2. Lower Canine: Note how deep the pocket is on this tooth (the third section from the bottom)! 3. Upper Canine: This tooth was only partially cleaned before extraction. Much of the enamel had been eroded. 4. Incisor: This tooth had a very small attachment area. 5. Incisor: This tooth had a very small amount of enamel, a large exposure area, small pocket area and almost no attachment to the jaw. Luckily, canines with extensive root exposure are usually not as difficult to remove compared to teeth without root exposure because there is much less holding the tooth in the mouth. The same applies to the incisor that adjoined the canine. We performed a new procedure on Rosie and it was very successful. After the tooth had been extracted, we used the laser to go into the open cavity, which cauterized the entire area to stop the blood flow and killed all bacteria that it touched. It also literally creates a scab over the wound area. As with other laser surgery, this should aid in the healing process. After the laser work was done, the wound cavity was packed with absorbent material called gelfoam. We sutured over the gelfoam and layered additional gelfoam into the suture line. This will stop any bleeding and makes wound closure much easier to accomplish. The gelfoam, which acts as a coagulant, will ultimately dissolve. 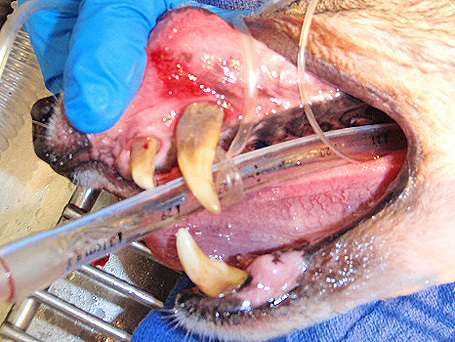 Above: Right side immediately after the procedure showing where the canine and incisor were removed, packed, and treated. After the upper canines and incisors were removed, a close inspection of the lower canines revealed significant pockets on the backsides of the teeth. Those pockets indicated that there was little structure holding the tooth in place. It simply made sense to extract those teeth as well, which in Rosie's case meant she would now be toothless but without pain. The picture of her mouth without teeth is not a pretty one right now, however, in just a few days she will feel like a different dog. She will not have any problems eating so that is a non-issue. Prior to these extractions, her mouth had to have hurt all the time. Now Rosie will be pain free, at least as far as her mouth goes, for the remainder of her life. We hope to have photos after the healing is done. Sorry, Rosie will not be getting false teeth. Above: Dental work one day later. I neglected to give you an update on Rosie’s dental procedures and was just on the NGAP website and saw her pictures and article. I wanted to THANK YOU all for greatly improving her health. While it’s a sorry sight to see her tongue dangling out of her mouth, she truly enjoys eating now and eagerly looks forward to each meal. The first week or so after we brought her home were a little traumatic (for us more than her). She had difficulty eating early on (canned food moistened with water) but we saw a marked improvement each day. She did lose some weight in the first couple of weeks, but has regained it all. Her diet now consists of small size kibble, moistened with water, mixed with canned food. She has no trouble eating and her greyhound brother doesn’t mind picking up what she splatters all over the floor! She enjoys small, soft treats as well (dog biscuits are a challenge but she tries). Again, THANKS to all of you for a wonderful job. We are truly grateful we found NGAP for both the boarding facility and vet services.